Fannin County Middle School’s PBIS Team is honored to represent the school’s accomplishment in implementing the Positive Behavioral Interventions and Supports ( PBIS) framework. The success of this framework involves dedication and effort of all teachers, staff, administration, students, and others that are involved in making a difference is the lives of the students. The Georgia Department of Education recognizes PBIS schools for improving their school climate, implementing PBIS with fidelity, and improving student achievement through the evidenced-based framework. To be eligible for recognition, schools must complete an End of the Year Report containing required data. Certain criteria is required to reach three possible levels: Installing, Emergent, or Operational. 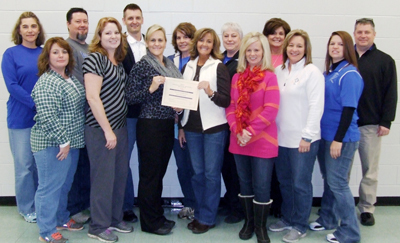 Fannin County Middle School earned the top level, Operational, and was recognized and presented with a certificate at the State PBIS Meeting, on December 1st, 2015 in Atlanta, GA.